Graphite pencil on paper. Another year, another horse. 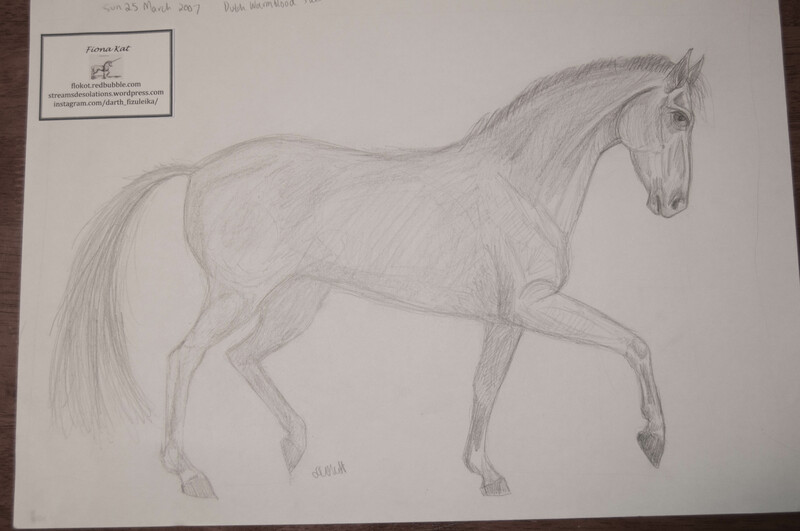 This one inspired by a photograph of a Dutch Warmblood, and drawn in March 2007. Posted in art and tagged art, decluttering, drawing, graphite, horse, illustration, pencil, sketchbook, sketching on September 1, 2015 by Fiona. 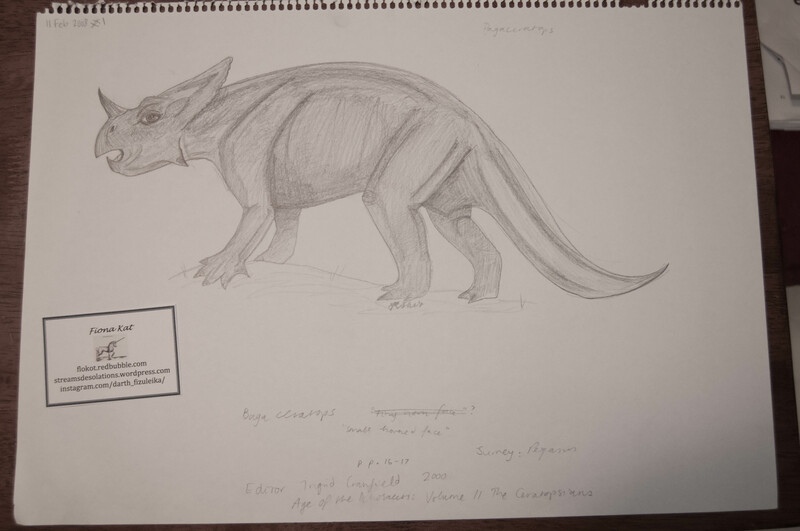 This is a 2008 sketch in graphite of the Mongolian dinosaur genus Bagaceratops. As observers of my drawings may notice, dinosaurs have formed a perennial theme for me. I absolutely love drawing their unique forms, studying books about them, learning about their fascinating history and generally being an all-round dino geek. It’s an obsession I have had since the age of 12 and now I’m in my early 30s* (when did that happen?!) I still can’t shake the need to return to the dinosaurian and pterosaurian themes in my art. *I was in my 20s when I drew this. Posted in art and tagged art, Bagaceratops, decluttering, dinosaur, dinosaurs, drawing, graphite, pencil, sketchbook, sketching on August 25, 2015 by Fiona. This is from several pages of pencil and ink fineliner drawings around 2007-2008 representing snippets of my memories of my rural upbringing. I come from a part of the world where discarded tractor tyres are sometimes used as driveway markers. Some farmers go as far as to attach reflective markers to catch the glow of the headlights of passing cars. It’s a novel solution to the problem of finding one’s driveway entrance in dark areas with no streetlights. Posted in art and tagged art, decluttering, fineliner, ink, pencil, rural, rurality, sketchbook on August 18, 2015 by Fiona. Hand me a pack of felt tip markers and I’m in my element. This A3-sized drawing from my 2007 visual art diary is part of my “gothic girls in fishnets” phase. Not that anyone ought to outgrow that phase, I mean, I certainly haven’t! 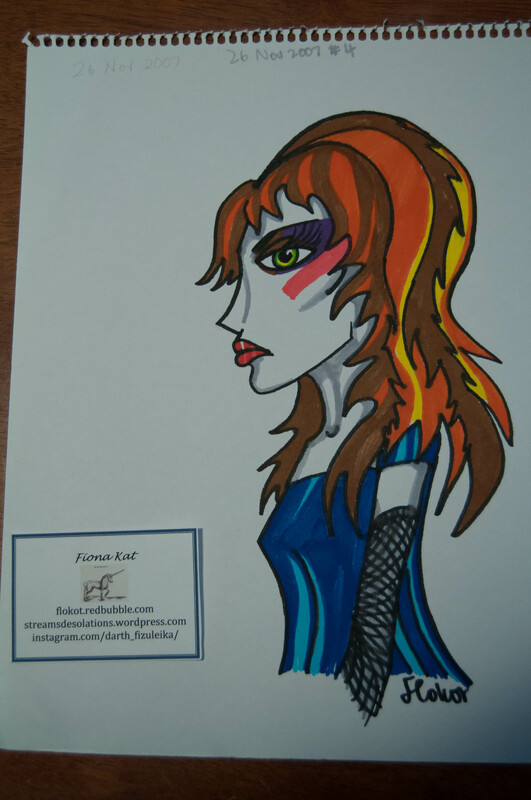 Posted in art and tagged art, colourful, decluttering, drawing, felt tip marker, goth, sketchbook, sketching on August 11, 2015 by Fiona. In late 2007 I started playing around with drawing ideas to try to represent the Christmases of my childhood. 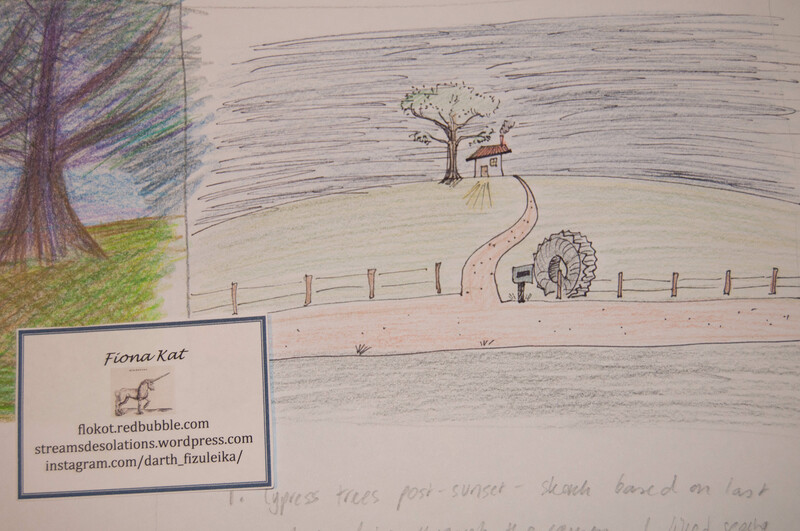 I intended them as thumbnail sketches or ideas for a subsequent painting idea that I never completed. Maybe one day I’ll return to the theme! There’s something very evocative for me about Christmas and the nostalgic emotions it stirs in relation to what is no-doubt a romanticised mental picture of my childhood. These drawings here were Sharpie fine point permanent marker and pencil on paper. 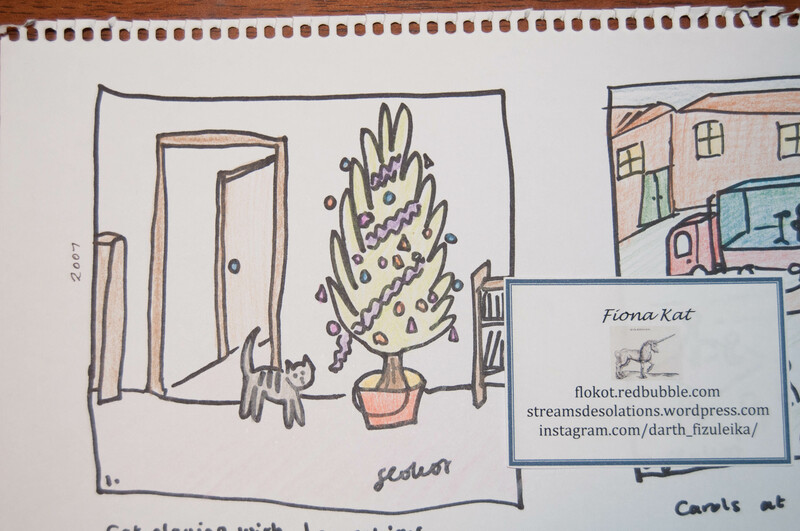 Posted in art and tagged art, cat, christmas, decluttering, drawing, felt tip marker, memories, pencil, sharpie, sketchbook, sketching on August 4, 2015 by Fiona.